Nowadays, if you have a kid, you probably have to listen to notations that you should limit the time a toddler spends with gadgets. And they are probably right because if you don’t restrict your 2-year old in using the gadget connected to the Internet, it can get you both in trouble. However, we know that today it’s almost impossible to take a tablet away from your toddler as we live in the age of technologies. So, why not to turn your iPad into a useful instrument which would help your child develop and learn new things? Fortunately, App Store is full of interesting apps for toddlers even if you are not ready to pay for them. So, let’s take a look. This educational app for toddlers collects more than 90 games for kids of 2-8 years old. With PBS KIDS Games you can get your child occupied with some useful things. Playing your iPad a kid will learn some basic skills and knowledge, develop his or her intelligence, creativity, and logical thinking. 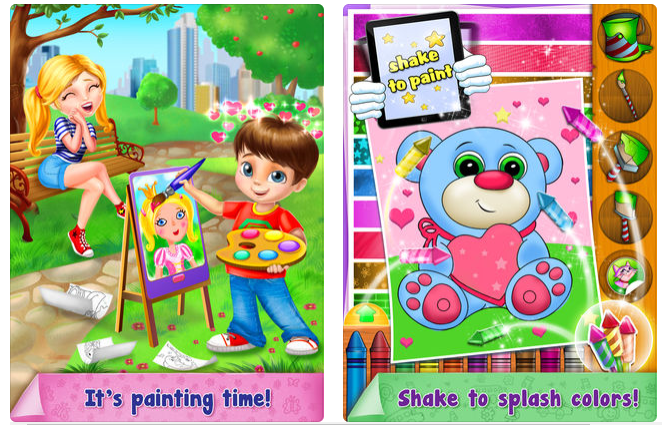 There are many mazes, puzzles, dress-up games your toddler will love. The app is specifically designed for toddlers so that they can use it safely. The app doesn’t have any in-app purchases. Kids will love playing with their favorite characters from PBS KIDS and will definitely find the best games. Your task as a parent is to direct your toddler and watch the space the app takes in your iPad’s storage. Remember that playing iPad can also be a good time you and your child spend together. Another app for your toddler’s education. The interface is simple enough for a 2-years-old so your kid not only will get used to electronics but also will safely learn some basic things such an alphabet, arithmetics, colors, forms, simple songs and so on. The games are available on the site Starfall developed by Stephen Schulz who had problems with studying as a child but now is a Ph.D. Now his task is to help kids develop by giving them all the resources they need. So, let your toddler play and develop at the same time! This is the coolest game for children of all age groups (especially toddlers) and their parents. Your kid should help the Gloop family of cute aliens fix their spaceship. The game is highly interactive. A kid should take photos of items around and find the necessary parts to repair the spaceship. After everything is found the Alien family can get back to their home planet! Gleep and Glop, alien children, will give some useful clues. The best part is that this app encourages adults and toddlers work together. As a parent, you should help a child review the pictures and solve a problem. The game has the good system of motivation, it is not only fun but also teaches toddlers problem-solving skills. Highly recommended! The developers of this app claim that it is perfect for preparing your kid for school. This is the lite version of the app, here you can find four different games connected with number recognition, letters, patterns, and matching. The full version contains 8 more games on other skills. The advantage of this app is a good and understandable motivations system. A toddler is guided by the monkey and takes prizes if he or she succeeds. It’s a good way to let a kid know that studying can be fun. Ok, not all apps for iPad that are good are about counting and letters. This game is just fun because it’s about… singing along! If you don’t mind your child being noisy, little kids love this app. It’s colorful, it contains 12 different interactive singing along games. Your child can learn useful skills and sing at the same time. This app will bring you and your child so much joy! But be careful, it contains in-app purchases. For more games for children, check this article: 13 Free Fishing games for kids (Android & iOS). Another good app for preschool education and just for the pleasure of your kid. It provides several games devoted to different basic skills such as spelling, tracing, counting. The games develop creativity and cognitive abilities. The menu is intuitively understandable so children will cope with it themselves. If a toddler is good at a game, he or she is awarded a cool sticker. As I have already mentioned, when choosing an app for your child you should pay attention to the system of motivation. When it is good, it will be a pleasure for a toddler to become better and better in some skills. The game is really cool but in the free version, not all features are available. Pay attention to in-app purchases. Ok, we all know that for our generation the most common source of education and fun is YouTube where you can find anything. However, it is not that safe for children because of some offensive and parental advisory content. Fortunately, there is special YouTube for kids where they can watch only good videos. YouTube Kids provides all kinds of parental control. A toddler has his or her own account. You can block any videos you don’t want your child to see and watch history. What is more, the app provides blocks for younger and older children up to 12. Be sure everything your little one will see will be appropriate, useful and fun! This is a great educational platform where you can find almost all types of activities your kid needs: more than 4000 cartoons, books, games and so on. Everything that is needed for preschool education is there. The app supports 7 different languages so your child can learn a foreign language as well. The app has a friendly interface and it is a kind of an app when one app is enough. However, to access all the content, you need to subscribe. But even without a subscription, your toddler can enjoy these games. Elmo Loves ABCs is the app to learn the English letters with fun. Don’t you think that learning alphabet doesn’t have to be difficult, boring and monotonous? In this app, each letter is accompanied with funny games, coloring pages and videos of Sesame street series your child will definitely love! What’s more, the app provides protection from accidental exiting the game. So you can be calm about your toddler using your iPad. As for disadvantages, the lite version of the app gives access to only 3 letters of the alphabet. However, all the games with them are available. Turn your iPad into a blackboard where you toddler can draw everything! Little children love drawing in tablets, it is the proved fact. Unfortunately, many apps for drawing are paid. This app is one of the best you can get for free. Drawing pictures in an iPad is a good way to distract a fussy kid. What’s more, it develops creative abilities. You will like drawing together with your child too! This version is free and there exists a paid version of this app. However, the free version has all the basic functions and even more. But be aware of in-app purchases. A great colorful puzzle game for toddlers 2-6-years-old. Beautiful pictures attract your kid’s attention and keep them busy for a while. What is more, it is quite useful, as a child gets such skills as matching and puzzle-solving, learns the names of animals, fruits, and other items, and develops visual memory. It’s a very easy and useful game you little kid should try! The funniest game ever! Is your toddler not allowed to play with food in your kitchen? Give him or her such a chance! A player in this game should feed two monsters with the food they cook on their own. Let your child figure out what monsters like and don’t like to eat. The game is not just fun, it teaches toddlers to distinguish between food and gives an idea about basic cooking operations. The interface is also good for little kids. A cool game for very little children. The game teaches names of animals, where they live, what sounds they make. The app contains many mini-games connected with animals. The free version contains 9 animals. To unlock more, you will have to pay. But even the limited version is still fun. Be careful — in-app purchases. Few children don’t like coloring. Coloring pages are famous for keeping toddlers busy for a long time and develop their creativity. This is a good coloring app with many tools and coloring pages. Everything your child draws you can save to the gallery. This is probably the best coloring app for little children. Many tools are available in the lite version. Nevertheless, its biggest disadvantage is that the free version contains ads. Please, be aware of in-app purchases. This is a very popular game where your child (or you) should watch after a cute cat that lives his life. You should help him with all the needs and spend time together. What is more, he can talk repeating your words in a funny voice. 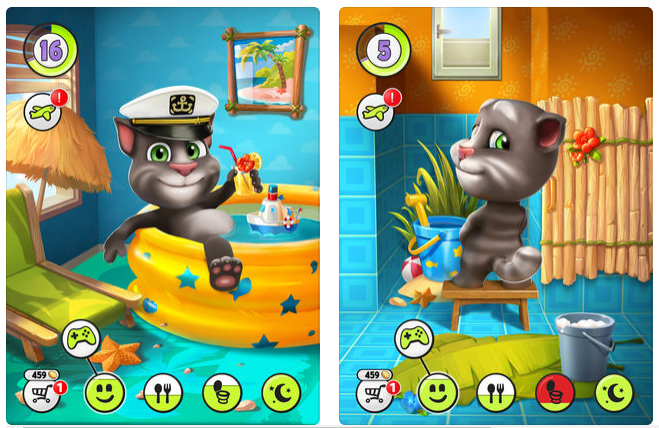 The game will not only get your toddler busy but also will teach how to look after a pet or themselves. A very cool and absolutely free educational game for children under 5. The cute fish will teach your toddler all the basic things from the alphabet to how to match pictures. The app has 9 different activities that will help your kid develop and have fun. The interface is friendly, colorful and cute. The app doesn’t have any in-app purchases, so be sure your child will be safe while playing it. Another cool, colorful, and free education app made by Duck Duck Moose (a part of well-known Khan Academy occupied with toddler’s education) is Musical Me. It will develop your child’s memory, musical hearing and abilities, and rhythm sense. The game has activities with different songs (at least 7 of them) and musical instruments. Your child will be happy to make and recognize sounds in this game. 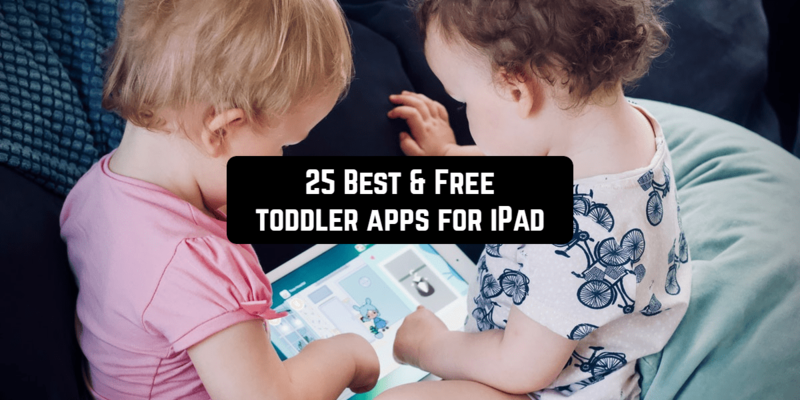 This app is perfect for you if you want your child under 5 to learn how to plan things, solve problems and calm down if necessary. “Breathe, think, do” is a strategy of problem-solving, it will help your child in constrictive decision-making and self-control. In this game, your kid helps The Monster cope with challenges in some everyday activities. You can personalize the app by adding your own emotional language, phrases your child will hear as encouragement. The game is extremely helpful for fussy or hyperactive children. Using white noise apps is also a good way to calm a fussy kid down. Recommended article: 11 Best white noise apps for Android & iOS. This app for the kids that start reading. It has many books for beginners which a kid can read or listen. What is more, there you can find some songs and quizzes for children. The books are divided into categories according to the level. The words a toddler learns can be added into an integrated dictionary. The library is constantly updated. This app is free to download: as a free user, you can get access to 30 books, 20 songs, all the quizzes, and a 450-word dictionary. Even without a subscription, this app is quite useful. Todo Math is an app for learning basic math skills. The app has a wide range of math games which your toddler should pass to get an award. There are functions of daily practice and math challenges to make the process of learning more exciting. The game contains 700+ different activities. The app is paid, but you get an opportunity to try it for free during the trial period. From all the popular games, this is the one toddlers like the most. Why? Who knows! It’s bright and colorful and something is flying and crashing — what else a kid can need for happiness? For those who have slept for the last 10 years: the point of this game is that you throw little angry birds to the constructions with pigs to destroy all of them. Your kid will definitely like this game, but we would recommend not letting him or her play without parental control. Let your little one explore the town! In this game, a player can visit different locations at Dr. Panda’s home and town, such as a park, supermarket, police station and so on. In each place, there is a role-playing game. The app is good for understanding the purpose of places in town and everyday activities. It will be a great game for the smallest children which will make them feel like grown-ups. This version is free, however, some locations are locked and need payment. A quite popular game that will bring joy to your kid (and to you). 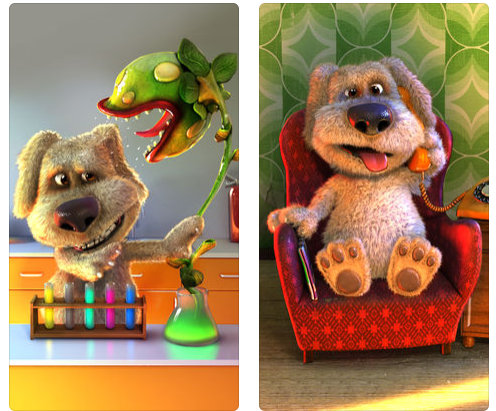 Ben the Dog is a retired chemistry professor who doesn’t like to talk, but your kid will definitely make him speak! Ben repeats everything in a funny voice. What’s more, a child can make Ben take chemistry experiments with unexpected effects. So let your toddler play and have fun, but don’t forget to watch — the app is good for toddlers but is not designed specifically for them. Another cool and cute game to make your toddler busy and happy. It is the simplest restaurant simulator where a child should cook dinners from 30 different ingredients. The instructions are easy to understand so it will be fun both for you and for your kid. All little kids like something that is moving, driving or flying. This app will help a toddler learn types of vehicle (from 8 different categories). The app has many activities where your little one will learn the types of transportations, how to match transport and a driver, and some basic road situations. The app will develop your toddler’s memory and attention and broaden their horizons and will help you both have fun. So, turn the time your kid spends with an iPad into a useful and fun adventure! But don’t forget that the best time your toddler spends is when you are together.